Archive for tag "EU PVSEC"
The more I learn about this company, the more I like it. 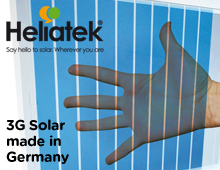 Heliatek is a world leader of Organic PV (Organic Photovoltaics) and they are getting ready to prove it. 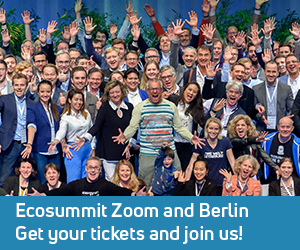 Since we visited Heliatek 6 months ago in Dresden for Ecosummit TV, a couple of things have happened. Heliatek has a new CEO and a beautiful new corporate identity. They’re in the middle of building the first factory in the world for OPV panels with a roll-to-roll vacuum production process. “For our next-gen organic solar cells we had to invent a totally new production system,” says Heliatek’s CTO Martin Pfeiffer. Heliatek’s factory of the future goes live in 2012. Kleiner, VantagePoint, Khosla, RockPort and DFJ take note: Heliatek plans a new funding round next year and wants the best US VCs in. A multi-billion dollar market is waiting to be conquered and 3G Solar made in Germany volunteers to do the job.